In our quest to bring you a wide range of urban thought and action, Urban Omnibus has, over the past two years, shared perspectives on the social and environmental promise of vertical density, on the rich diversity of New York’s housing typologies, and on the specific social and cultural conditions of certain New York neighborhoods, from Jackson Heights to the East Village to East New York. This week, Architectural League Executive Director Rosalie Genevro brings those three themes together in a historical snapshot of Starrett City, a major housing development built between 1972 and 1976 in Southeastern Brooklyn. Starrett City’s history is singular, formed in the urban crosscurrents of race, class, housing policy and the ever-evolving idea of community. As Genevro delved deeper into this story, speaking with long-time residents and some of the people who helped create and manage the development, she found much more than an account of how a fascinating New York neighborhood got to be that way. She found a thought-provoking counter-example to trends in housing and urban policy that prioritize individualized kinds of built form and ownership over shared resources and collective aspiration. In thinking about these questions, New Yorkers have a number of rich traditions to draw on. The cooperative housing model is much more ingrained here than in other cities. The diversity of our multifamily housing stock already relies inherently on sharing — boiler systems, lobbies, hallways — and on the intensive use of our streets and other public places. Looking a little deeper into the social story that inhabits the built environment — in this case, the story behind one of the last New York City developments built on the tower-in-the-park model — can only help illuminate new thinking about the relationship between people and buildings, and just might challenge us to question some of our basic assumptions about house, home and the American landscape. –C.S. Some months ago I was asked to take part in a series of lectures on the reverberations of the idea of “house” in American culture. Being a New Yorker, I immediately moved away from “house” and towards “home” and “apartment.” To my mind, American mythmaking has given far too much weight to “house.” What interests me more is the idea of home and the many, many different ways Americans construct that. If the idea of “house” didn’t wield so much influence, what might that mean for public policy? I have been intrigued by Starrett City for quite a while, since spending time in the neighboring district of East New York working on Architectural League projects on housing, park and community design. Starrett — renamed Spring Creek Towers in 2002 — is a community that works. It is one of the most racially integrated areas of the city; it is safe; and if the buildings themselves seem uninspired on the exterior, they nevertheless provide accommodating, affordable housing for moderate income New Yorkers in a well-tended landscape. There is a large group of residents who feel deeply connected to Starrett/Spring Creek Towers and who feel that it provides all they are looking for in a place to live. So the question is: How did a group of high-rise, unlovely brick buildings designed on the much-maligned tower-in-the-park model and built on a former landfill on the very edge of Brooklyn ever manage to become “home”? The 46 residential towers of Starrett City, along with parking garages, a power plant, sports center and shopping center, were built from 1972 to 1976 on a large, marshy, city-owned site in southeast Brooklyn. Since the late 1960s, efforts had been made to develop the site, which offered the possibility of creating a very large number of new housing units without having to relocate current residents. The project site, between Flatlands Avenue and the Shore Parkway on the edge of Jamaica Bay near the Brooklyn/Queens border, had been used as a landfill. It was located across a small inlet from the Italian and Jewish neighborhood of Canarsie, and on its north side abutted East New York, which had changed during the 1950s and ‘60s from working-class Italian and Jewish to largely low-income black and Hispanic residents. New York City in 1972 was a city under stress. Crime was high and increasing; racial tensions were inflamed, the city’s manufacturing job base was disappearing, and its fiscal situation was deteriorating. Liberal Republican John Lindsay was mayor. He had attempted to introduce new approaches to planning, experimented with decentralization of control of the schools, and made an effort to integrate residential neighborhoods through introducing scatter-site public housing. But the ambitious 1969 plan for the city, developed by the City Planning Department, was never enacted; the effort at school decentralization in Ocean Hill-Brownsville eventually resulted in an enormously destructive teachers’ strike; and attempts to integrate New York neighborhoods produced an tense situation surrounding the Housing Authority’s proposal to build a project in the middle-class neighborhood of Forest Hills. In general, there was widespread skepticism about the motives and capabilities of liberal-led government. Work to develop the landfill site had been begun by the United Housing Foundation (UHF), a union coalition that had developed a large number of cooperative apartments in New York over the years. UHF and its leader, Abraham Kazan, were pioneers in the development of workers’ cooperatives in New York City, and had created a substantial body of well-built, carefully managed, desirable and long-lasting housing that continues to this day to account for a very significant portion of New York City’s middle-income housing stock. For this and other projects, Kazan and the UHF worked with the architect Herman Jessor, who devoted his entire 60+ year career to the design of housing for workers, including the more than 40,000 units built by the United Housing Foundation in such projects as Penn South, Hillman Houses, and Co-op City. Jessor was known for his mastery of construction technology and building and zoning codes, and a superbly honed capacity to deliver the greatest possible amount and most practically usable space in his apartments. In keeping with its other projects, the United Housing Foundation envisioned the Twin Pines development — as Starrett City was initially called — as a cooperative. But rising construction, financing and energy costs, and the fact that UHF was simultaneously developing Co-op City in the Bronx, forced the organization to sell the unfinished development. It found a willing buyer in the Starrett Company. Starrett saw potential in taking over the project because of a recent change in the tax laws, making it possible to sell tax shelters for low and moderate income rental (but not co-op) housing and thereby providing a very lucrative benefit to investors. Starrett hired a Lindsay administration housing official named Robert Rosenberg to create the integrated project that Starrett had promised the Board of Estimate — but which the company had no idea how to deliver. Realizing his task was first of all a marketing challenge, Rosenberg made a number of moves to make the development more attractive and to reinforce the sense that this was a fresh new community. He insisted on completing the buildings near the Shore Parkway first, rather than on the north near Flatlands. Prospective tenants would come into the development from the water side, rather than passing through the deteriorated blocks of East New York. He invested more in the landscaping than had originally been budgeted, and built an on-site sports club. He added canopies to the buildings, built a shopping center, and successfully lobbied to have an elementary school built on the site, with lots of parking that proved to be a significant attraction for teachers. He created a private security force for the project. Making the apartments themselves appealing required less effort: the fact that the original architectural program was for cooperative units meant that they were larger than typical New York City rental apartments. Jessor designed apartment buildings from the inside out, with cross-ventilation in the bedrooms, entry foyers and windowed kitchens. Rosenberg skillfully used all these features in his marketing. He organized the first focus groups ever employed in multifamily rental housing, and he made the first television ads for a rental development. He also managed the tenant selection process to make every building and every floor integrated. In 1988, 12 years after the development opened, an article in The New York Times called Starrett City perhaps the most integrated area of New York City: 62% white, 23% black, 9% Hispanic and 6% Asian or people of mixed race. Twenty years later, in 2007, the Starrett City census tract was 32% white, 41% black and 19% Hispanic. How these levels of integration were initially achieved — through the use of separate waiting lists for white and minority tenants — was the subject of a suit brought by the NAACP, which was settled in 1987 with an agreement that Starrett City would increase the number of apartments made available to minority applicants and that 20 other New York State housing projects built under the Mitchell-Lama program would set integration goals. This settlement was challenged by the Reagan Justice Department, which argued that the waiting lists constituted illegal use of quotas. This argument prevailed and the use of multiple waiting lists was ended. Notwithstanding the controversy and attention that surrounded the suits, something significant — a community — had been established at Starrett City. Whether because of Rosenberg’s skillful marketing, or the fact that he and his tenant relations staff had an ample budget to fund tenant clubs and activities, or something about the self-selection of the tenants, or whether it was the aspiration to integration itself, Starrett residents seem, from the start, to have perceived their development as something particular and appealing. Solomon Peeples, a resident of Starrett City since it opened and part of the managerial corps of the New York City health department before he retired, told me this winter that “Starrett City represented what I call the American Dream, where people of all races, ethnic groupings and incomes could live together, and I thought it would work. I figured my son would have to live in an integrated world so he might as well grow up in one…” What began as Twin Pines, and became Starrett City, and now is Spring Creek Towers, has changed, but has not lost its sense of being something distinct. Rabbi Avner German, who was one of Starrett’s original tenants, said in 2007 that Starrett is “not just another place,” that “there was a sort of — the Hebrew word for it is chavod — respect and honor that you felt that you lived at Starrett.” The history of Starrett City offers up a number of lessons about house and home, some of them often articulated but just as often ignored. They are worth thinking about. Management is more important to creating successful places than architectural form. Form can be supportive, but it is not determinative. Starrett City was under construction while St. Louis was dynamiting Pruitt-Igoe. Towers-in-the-park can be great places to live, if they are well managed and the promise of the name is delivered in the site and landscaping. New York has plenty of examples of towers in the park that work, including Stuyvesant Town and Penn South and Fordham Hill in the Bronx. Government participation in the housing market can produce important collective benefits. 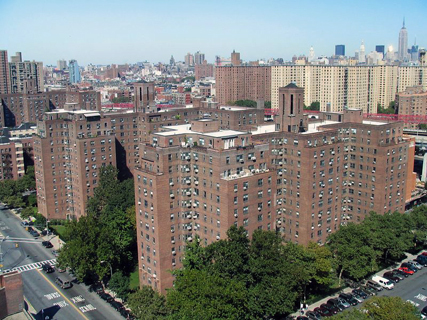 Starrett City was made possible by support from a number of sources: federal tax credits to encourage production of housing; state benefits via financing through the Mitchell-Lama program; and city help including the provision of the site. A number of years after it opened, Starrett City and its tenants became a major beneficiary of the Section 8 subsidy program. Starrett is the largest federally subsidized rental project in the country; and it has provided more than 5,800 accommodating, decent apartments, housing many, many thousands of residents, for decades. Home is where the heart is. Mr. Peeples’ American Dream — the mixture of cultures, classes and incomes — and his and his neighbors’ embrace of their high-rise, red-brick apartment towers as home stands in vivid, provocative contrast to the imagery commonly associated with the supposedly all-encompassing American Dream of pastoral landscapes, single family houses and white picket fences. Cities, and density, and living together, are likely to be a big part of our collective future. It is good to know that there are models that work. Home can have party walls. In over 20 years as the executive director of the Architectural League of New York, Rosalie Genevro has pursued the League’s mission – to nurture excellence and engagement in architecture, design and urbanism – through consistent innovation in the content and format of live events, exhibitions and publications (both in print and online). She has conceived and developed projects that have mobilized the expertise of the League’s international network of architects and designers towards applied projects in the public interest, including Vacant Lots, New Schools for New York, Envisioning East New York, Ten Shades of Green, Worldview Cities and Urban Omnibus. great to read and see. The commercial is a time capsule of accents, hair and interiors. Thanks to Rosalie (R) for the interest and the belief that East New York is really New York City East, where the other half lives. Her work spans over 20 years with community residents. There is more to come. Follow Urban Omnibus and live New York. Great article! The importance of management to quality urban housing becomes very clear through your case study. I’ve been finding the same thing while researching housing blocks in Russia. Definitely something for planners, developers, policymakers and other concerned citizens to keep in mind. Perhaps architects can develop ideas for long-term management as part of the design process. It is quite interesting to read and revisit the inception of this great development. But let’s face it although Spring Creek is a State Mitchell Lama under HUD guidelines favoratism is being practiced. How is it possible that one person is able to “rent” four apartments breakdown walls and make a penthouse? Have a library and a school to teach the Torah to the masses and now since he is no longer alive the four apartments will be his sons? Yet others have to adhere to the strict guidelines. What’s fair is fair so what this individual was an original tenant! Rangal was tried and convicted for having more than one apartment in Harlem why is this tenant @ Spring Creek allowed to have 4?????? Bronwyn Breitner and James Slade describe how their students reconsidered one of our most familiar architectural spaces, the residence, in the context of the Bronx's Lower Concourse.